I’m currently wearing a mix of the DK PVP gear from Mists of Pandaria and the Death Knight Deathlord set from Legion to match with my sword. The Deathlord set isn’t as green as I would like. But it’s fairly green and it goes well with the PVP gear and the sword. It’s my Unholy set, since I find myself running Mythics as DPS a lot more often than as a tank — we have a pretty dedicated tank in my guild so when I tank it tends to be in PuG’s. And yes, I really do need a red transmog for when I’m tanking and a green one for Unholy. If I was using Frost much (I’d try it, but I don’t have weapons for it) I’d have a blue transmog for it. This is really important, okay? No, no, it’s silly, I know that. Let’s chat. Games and stuff. Q4tQ: Have the dates for the next Diablo III season been set? Is there any news about which theme it’ll be? The current estimation is that the season will be ending on Sunday, September 16. We do not know what the theme will be yet — that has yet to be announced. Q4tQ: Does it feel weird that prepatch was all Horde vs Alliance, Sylvanas grrr, Jaina rawr, and then we get into the expac and see none of that? Spoilers for Battle for Azeroth and Stormsong Valley to follow. Maybe you saw none of it. I saw the Horde descend on a small farming village and trade hub, Brennadam, and begin firebombing the place. Out of a clear blue sky, dozens of airships just show up and drop bombs on a town full of traders and farmers and start doing things like immolating them and impaling them on spears to walls. A solid chunk of questing follows that’s basically just The Horde has invaded Stormsong Valley in force and you have to drive them out. So maybe nothing like this happens Horde side — my Tauren just started on the Zandalar stuff — but Alliance side? The war is front and center in at least one zone. I haven’t yet looked into archaeology this xpac. How is it? Good rewards? Are the quests decent, like in Legion? Okay. I try and stay positive but come on, it’s a profession in World of Warcraft. Of course it’s awful. It’s especially uninteresting this time around, and I haven’t even bothered to level it. Q4tQ: I usually play Alliance, but want to see the Horde side story as well, so created and boosted a rogue. But since she is on the opposite faction (and on a new server for me), she is broke. 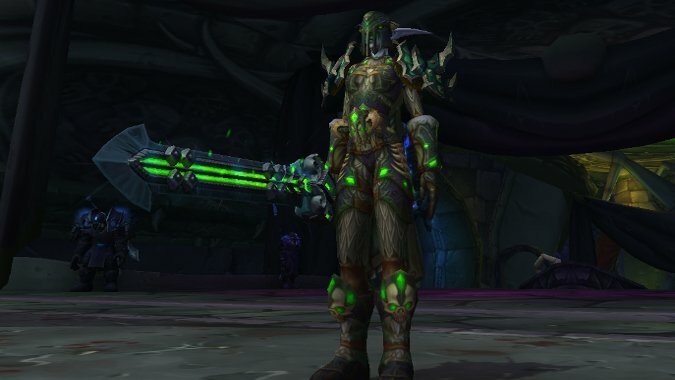 Which of the older raids and/or dungeons would you recommend running to get enough gold to support my transmog every new piece of gear ASAP habit? You’re level 110? 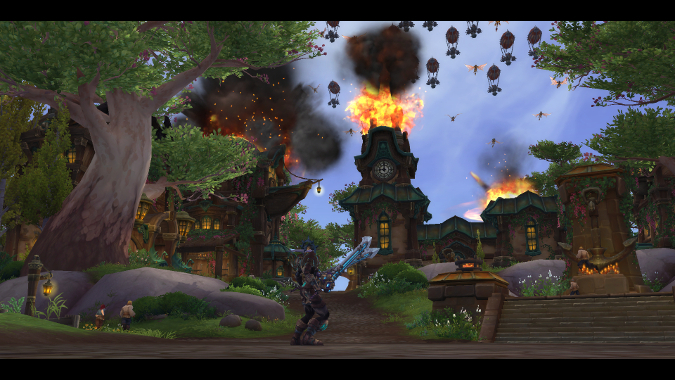 Go blow up Cataclysm and Mists of Pandaria raids first off the bat. Then, try Warlords of Draenor on normal and if that seems easy step it up to heroic. Mythic can be tricky even at 120, because some mechanics will instantly bug out or reset a fight, but I’ve done up to Mythic Hellfire Citadel. At 110, I’d stick to Normal Hellfire, but it’s still pretty decent money and vendoring. But as people pointed out, Trial of Style starts Aug. 31, so you’ll have plenty of free transmogs for a while. Q for people who have done island expeditions: So how are they really? They don’t sound like my kind of activity but I need 5 different ones for “research.” Every time I get mentally revved to give them a shot I read another article and back away. I’m not really interested in the “race to get stuff” aspect. If I wanted smart, pvp-like AI opponents I’d actually do pvp. Just nothing about them sounds fun so I’m hoping you guys can convince me they’re not that bad. There is a sword from Heroic Island Expeditions named the Plundered Blade of Northern Kings. Since it drops from Heroic Island Expeditions, I want very much to do them until I get it. Otherwise, I find that Island Expeditions are fun enough but would be more fun if they flex scaled how many people could do them. But overall they feel kind of like scenarios and the NPC’s that don’t act like NPC’s can make them interesting and fun if you’re looking for a change of pace from dungeon groups. Okay, that’s the Queue for today. See y’all next week. I don’t have much to say about chili, sorry.